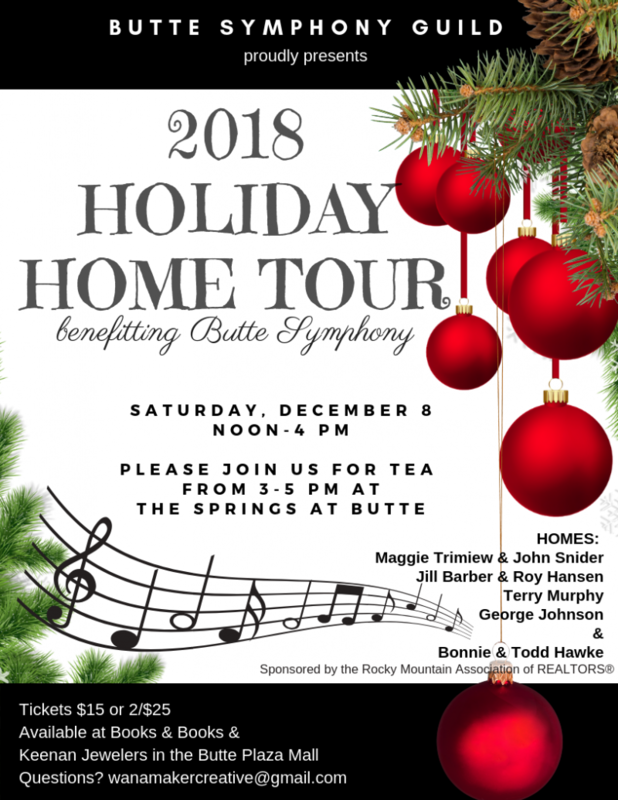 The happiest day of the Holiday season is the annual Holiday Home Tour supporting Montana’s oldest Symphony. The tour is December 8 from Noon-4:00 pm followed by a Tea Party with cookies from 3-5 at the Springs at Butte. Tickets are $15/person or 2 for $25. They are available at Books & Books and Keenan Jewelry at the Butte Plaza Mall and at the door to the five homes. This year we will tour a spacious modern dream home with a kitchen any “Foodie” would covet, one of Butte’s most opulent and resplendently restored historic mansions, a masterpiece of painstaking traditional handcrafting by Artisans, the most beautiful modern urban penthouse condo in the Sears Lofts and a man who is a legend for his curated collection of antiques and his Christmas Spirit…literally a Santa for every stair. 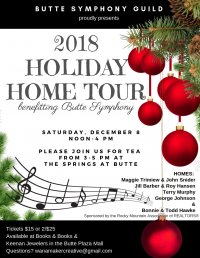 Keep the piper’s piping and drummers drumming this holiday season by supporting the Butte Symphony Guild. All proceeds benefit Butte Symphony.